All Gowanus Canal Conservancy tours are now booked for Spring 2019. Please check back in a few months for an update on Fall 2019 scheduling. Tours give an overview of the history of the Gowanus Canal, information about its ecosystem, and an update on the Superfund cleanup. 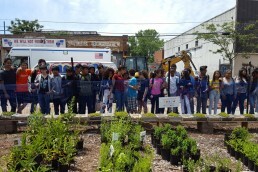 Students learn about industrial waste and Combined Sewer Overflow (CSO) as the two primary sources of water pollution and the clean-up initiatives that are underway. 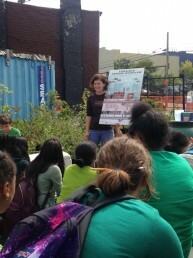 Green Infrastructure – NYC is building thousands of curbside rain gardens. Learn how green infrastructure such as rain gardens and bioswales are engineered to reduce combined sewage overflow and provide benefits such as wildlife habitat, native species restoration and reducing the urban heat island effect. Waterfront Design – Learn how climate change impacts such as flooding and storm surge affect NYC waterfront communities. Students are introduced to the Gowanus Lowlands, the vision plan for parks and public space around the Gowanus Canal and opportunities for redesigning a more resilient waterfront. Environmental Justice – The Gowanus neighborhood is concurrently undergoing rezoning, development, and a Superfund clean-up process. Learn about how these changes re-shape the neighborhood and what’s being done to advocate for equitable outcomes for the local community. Tour length and content can be modified for grade level.